BURIED CLUES, real or imagined? When you are following a trail to what you hope will be a buried treasure (and not an empty hole) you are always following specific information given to you by a map and or markers in the field. When working on an outlaw treasure trail you will occasionally run across the hidden or buried clue. Most of the time these clues are metal but they can also be carved rocks or other objects that the outlaw had handy at the time. There seems to be a proliferation of information out there indicating these metal buried or hidden clues are just everywhere. When you are working on a trail and think you might have a buried or hidden clue the first question you should ask yourself is; “how would the person or group who put this in the ground get back to it”? Most of these treasures were put in the ground before 1900 and the people who put them in the ground sure weren’t expecting to use a metal detector to find their own buried clues. So how would you find a buried or hidden clue that would be important to working the trail? It has been my experience that any clue, buried or otherwise, if it is important to the trail, is marked on the map or in the carving. They didn’t leave clues at a site just for the fun of it so all of the clues would be important. This means that if they expected to find the clue there would HAVE to be something in the map or carving that tells them EXACTLY where to look and maybe even what to look for. Without this information they would be wondering around the woods like we all have, wondering what they are missing. When working with carvings or maps the creators of the map can (and will) be very ingenious in how they hide information. A carving can appear to be “sloppy” with the lines running long or being square when you think the should be curved, etc. Sometimes a carving is just as it appears but when dealing with the outlaws, they can be pretty damn sneaky in hiding information in the carving or drawing. You have to look at every mark just to make sure it isn’t some additional piece of information you may need to work the map. The information that leads you to a clue has to be specific, so if you find a piece of metal out in the middle of an open field, is it really a clue? Is there something specific that took you to it, giving you the exact distance and direction to go so that there wouldn’t be any guesswork involved about where it was? Treasure hunting is as much about being logical as it is about being diligent and persistent. Since this blog isn’t really about the KGC I will keep this short, but I wanted to bring your attention to a few things. For those of you that believe in the alleged KGC template for finding treasure, and I know you are out there, you should really research the Spider Rock treasure that was mentioned earlier on this blog. There are some very good photos in Steve Wilson’s book that show what could be considered a template for the alleged KGC template. One of the carvings is almost a duplicate of the alleged KGC template. Now at this point I’m sure there are those that will say this proves the Spider Rock Treasure was KGC but I’m sorry, it doesn’t. There is overwhelming evidence that the Spider Rock Treasure was Spanish. In my opinion, what you should be considering is the fact that J. Frank Dalton and his cohort, Orvus Lee Houk, spent a lot of time in Texas. The Spider Rock Treasure was a pretty big deal back then and it was before the time that J. Frank Dalton came out as Jesse James. It would be my theory that Orvus Houk, A.K.A Jesse Lee James III, was aware of the carvings on the Spider Rocks and manipulated the designs to use as his own to bolster his claims. Granted, I have no proof of this but since it has been proven the Spider Rock Treasure was in the ground well before the KGC existed then it would be a fair assumption that the alleged KGC template could have been manufactured using a composite of the different carvings of the Spider Rocks as a “template” itself. All you need to do is look at the different Spider Rocks and the variations of the carvings and you can see the real similarities. By no means am I an expert on all things treasure hunting but I would like to share some of my thoughts with those who would care to listen. I have worked on more than a few outlaw treasure sites and it has been my experience that without a map it is very hard, if not impossible, to locate the burial spot. Maps can come in many forms including those carved on rocks or rock bluffs, the ones etched into metal and those drawn on cloth or leather just to name a few. The outlaws for some reason seemed to like to make things as difficult as possible when trying to locate their treasure. The sites I have worked on have been laid out so that you had to have the map and the clues in the field to find the treasure. You couldn’t find the treasure with just the map or just the clues in the field. The layout was designed to give you part of the information from the map and the rest from the clues in the field. For this to work, the map may give you a symbol that tells you where to go and what you will find at that spot and then the clue that you find at that spot will give you the next direction to go. You would then have to refer back to the map to see what you will find at the next location and/or even the terrain you would traverse while following the line given by the clue in the field. This scenario can play out in many ways with the map giving you a direction and the clue giving you a distance or you may have a compass heading as a clue or marked on the map and the other will have the distance or the terrain you will cross marked on it. The possibilities are endless. Needless to say, without both the map and the clues in the field it is very difficult to follow the trail. The outlaw sites I have seen or worked can’t be worked with just the clues in the field, it takes the map also. A lot of the clues you find in the field won’t mean anything on their own, you have to have a map to look at them in context to get any information from them. Maps that are carved on a stone or bluff, in my opinion, can be easier to work than the maps made on something that can be carried around. To start with, you know the map is carved in the area where the treasure is so you don’t have to try to figure out what area the map goes to. Generally speaking, a treasure associated with a carved map is usually very close to where the map is carved. The person who carved the map may take you round and round, covering several hundred feet or even several hundred yards but you usually end up within site of the carving when you find the cache location. You can figure that a lot the symbols on a carved map will be topographical in nature, either showing you a picture of the terrain you will see as you follow the directions given or a “picture” of what you will find at the end of that part of the trail. Maps that are drawn or etched onto something that can be carried around seem to work differently in that they will still make you run around in circles but the distances can be much farther than when working with a map carved on a stone or bluff. To chalk or not to chalk? That is the question. I received an e-mail once telling me how I was wrong for chalking the symbols I had found. The guy never asked if I had pictures of the symbols without chalk. He was just eager to show how much of an amateur I was. I chalk all of the signs I come across, but only after I have taken plenty of pictures of them without chalk. I occasionally post pictures of the symbols I come across and the chalk makes them easier to see, but can hide the small details that can make all the difference in correctly working a site. I have a really nice digital camera that I use while working in the field. The memory card will hold nearly a thousand pictures, so I can take as many pictures as I want. I not only take pictures of the symbols, but the surrounding area as well. This makes it possible to reference the topography while studying the symbols from the comfort of your own home. I highly recommend that you add a digital camera to the list of tools you use for treasure hunting. When I am out in the field I carry a camera, gps, chalk, small whisk broom, pen, paper, and a few other things I have found that come in handy. Have you ever stumbled across a rock or tree that looks like a treasure sign, but doesn't fit any known site? What you might have is a survey marker. In times past surveyors would use trees as witness corners and sandstone or rocks as markers along the survey lines. Fortunately for us meticulous records were kept, so while researching a cache area I will also look at these old records. In many instances they will describe the size and shape of rock they use for a marker or the location of the witness corner. Many hours chasing false leads can be saved by just a few minutes of research. The BLM-GLO link listed on this blog site will allow you to search the records online, and if you are hunting in Oklahoma the Department of Libraries can send copies of plats and written records for a small fee. These are extremely useful tools for research. The Spider Rock Treasure is one of the most intriguing stories that I have researched. Steve Wilson is the author of, The Spider Rock Treasure: A Texas Mystery of Lost Spanish Gold. His work on this subject can also be found in the Great Plains Journals volumes 28-29 & 30-31. I have heard others proclaim that this is a KGC treasure, but after you read what is written it will become clear that this is of Spanish origin. Steve has done an excellent job of research and I highly recommend it to anyone who is searching for this treasure. I have been told that all but one cache was recovered. The one that was left wasn't economically feasible to recover at the time, but with the price of gold and silver it might just work out now. To try and fit the whole story into this blog would be an injustice. Amazon.com carries Steve's book and you can contact the Museum of the Great Plains at 580-250-0151 for the journals. The Great Plains Journals sell as a pair for around $17.50, plus shipping. Do yourselves a favor and read about this bizarre quest for treasure. For years now I have read on the forums how there is a giant conspiracy placing treasure sites under government control. This being done by turning the cache sites into national forests, refuges, parks, or whatever else can be thought of. Included in this list is the area in which I live, the Wichita Mountains National Wildlife Refuge. Rumors of these old rugged mountains being the hiding place of Spanish and outlaw fortunes have persisted even to this day. Did the government turn this area into a refuge to keep control of these riches? With just a little research you will find out that this is not the case. The truth is not as exciting as what the conspiracy theorist would have you believe. This area was part of the Kiowa/Comanche reservation and slotted to be opened for settlement by the Jerome Agreement which was ratified in June of 1900. Texas ranchers were able to delay the opening of the land for settlement. It was during this time that an organized effort was made by the Oklahoma City Commercial Club to set aside the mountainous regions of the Kiowa/Comanche land as a national park. It took huge amounts of lobbying on the part of the citizens of the twin territories (Oklahoma wasn't a state at the time) to convince the government to preserve this special area. On July 4, 1901, 57,120 acres were set aside as the Wichita Forest Preserve by President McKinley. In 1905 President Roosevelt issued a proclamation establishing the Wichitas as a National Game Preserve. If you would like to read the full story of how the Wichita Mountains National Wildlife Refuge came into being, the Great Plains Journal Vol. 13, No. 1 has the full account. If it weren't for concerned citizens, this area would have been opened for settlement and possibly would have prevented the bison and longhorn cattle from returning from the brink of extinction. There was no conspiracy here, just good fortune. I am going to explain the map I refer to as the I Left Kansas Map (shown below). Many of you have seen this map published in Oklahoma Treasures and Treasure Tales, but never this clean of a copy. There are a few parts I won't divulge, but I will give you most of the code. This is a fairly simple map to decode once you get the hang of it. Proberod I know you disagree with the location of where this map goes, but here I go anyways. It starts out saying I left Kansas carrying $74,000 and three bags of gold dust. Chief Wild Horse warned us that the US Cavalry were patroling the Wichita Mountains so we camped west of SM at kitchen. ..... ... ... 3 rock or rock with three marks on it ..... near spring covered( cow jumping over) my spoon. 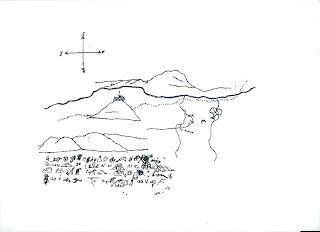 In top of.... SM ... .... and drew (man drawing gun) at (arrow noted on top of hill) a pistol pointing south. (Here it shows one creek coming into another as shown on map and there's an x to the right of one creek) Between x and spring (face) ... .... .. ... .... JJ. Some of you out there will come up with the parts of the map I left out and some may already have figured this map out. The gun they drew at the top of the hill actually pointed southwest to their campsite that I refered to as the kitchen. It's marked by the double J's along the trail near the creek. This can be found to the right of the hill with the arrow. Here you will also find three slash marks and an R, an X, and the word Spring. All of these things can be found in the code. What was found between the X and the spring? It was the rock map with the face profile also found pictured in Oklahoma Treasures and Treasure Tales. This is why the face is pictured in the code. Chief Wild Horse was a Comanche sub-chief and can be found mentioned in the Carbine and Lance written by Col. Nye. Upon close inspection of the flags in the code you will find crossed sabers denoting the cavalry and the pan or pot next to them gives you the word patroling. The author of this map was clever and this is shown by the use of a knee and ear to give you the word near. The gold dust was taken in a Kansas robbery by the James gang and can be researched to give you an idea of when this map was drawn. This map goes to the same location as the bucket code. The line of dots that go to the east of the lone hill is the same trail line that is mentioned in the bucket code. How's that for a teaser? Do see how some maps fit together and confirm what the other says? The pistol on top of the hill is still there. It's been carved into a biplane. The rock map with the face was removed by Joe Hunter and I have no idea of where it ended up. Somebody out there should know though. The rest of the story I'm not at liberty to say. I hope you enjoy this post. I will be slowing down posting, as I will be busy through the rest of the holiday season. I have invited several others to join in posting on the blog, so we may see some interesting things ahead. Jesse James Was One of His Names, aka the "Black Book", is considered the bible among some treasure hunters. In this book is a list of treasures in code from A to G. This list is long and impressive, but I have found that certain treasures are just repeats using different parts of the same map. How do I know this? I know which maps Joe Hunter had in his possesion and which ones were used in making of this list. You have to remember Joe and J Frank had meetings before Dalton went public with his "true" identity. With some research you can find other treasures in this list being mentioned many years before the black book was written. It wouldn't be hard to make the assumption that this list is nothing more than treasure stories Hauk had accumulated in his travels with Dalton, but a number of treasures in this list are real and Dalton, Hauk, nor Hunter ever recovered them. With this being said, you can find lists of treasures in any number of books that are based upon real caches. I'd like to know if Joe ever showed Dalton the Copper Map? I can't find any proof that he did. I'm sure if Joe had there would have been mention of it in the black book list. What an intriguing map it has been. Maybe sometime in the future I will post more about this map. I started this blog not only for entertainment, but to be a tool for other treasure hunters. I have included a number of links that are helpful for doing research. For those here in Oklahoma the rootsweb link can be used to find the township and range and the blm-glo link to find the original survey plats for the area you're researching. The Chronicles of Oklahoma site is a great place and contains loads of information and a few treasure stories. There are a number of map links and two of my favorite forum sites as well. I will continue to add links as I find them. Please feel free to send sites that you find helpful and I will take a look to see if it fits the theme of my blog. Here's a little news for those who do Masonic research. The Lodge has a cypher book, that will be coming out soon, which contains the first two letters of every word of their secret sayings. Mining the forums for those treasure gems is another way of doing some armchair hunting during the cold winter days. I've heard the "professionals" talk down about the forums and those who post but, I enjoy reading and learning from what is written. While I don't agree with all that is posted, I do like the debate that different opinions bring about. One of the best things I've found on the forums are the friends I've made. Some are beginning treasure hunters and some are very experienced. Two of my partners and good friends were made via the forums. I'm very grateful to Mark for introducing me to Ray. I would never have been this far ahead of the game if it wasn't for Ray and the help and information he has been kind enough to give me. The numerous picures of signs and symbols found on the forums have given me ideas of what to look for in the field and reasons to look at things in a different light. Take the forums for what they are and have some fun reading and posting. Don't be afraid to express your ideas or ask questions. Ron, Roy,Ted, John, Gene, Larry, Ernest, Jay, Matt, Bud, Betty, and any whose real name I may not know, I'm glad the forums have brought you into my life as well. While sorting through my e-mail, I came across one from Treasurenet. The newsletter had an article about coin roll hunting. I have searched through rolls of coins on occasion and there have always been a few old ones to add to my collection. The tellers at the bank just love it when you go in and ask for $100 in pennies. With the weather not allowing me to get out in the field, I thought this was a great time to try it again. I enjoy collecting half dollars, so that was the coin I decided to get. I bought all of the halves that the local bank had which amounted to 14 rolls or $140. A box of half dollar rolls is $500 and can be ordered through the bank. While that may sound like alot of money to dish out, it really isn't since you will be returning all the coins you decide not to keep. With my Walmart sack full of coin rolls in hand I eagerly headed back to the house. The Treasurenet article tells of Barber and Walking halves being found, but that just wasn't my luck today. It was an enjoyable and profitable time, though. In the 14 rolls of half dollars I searched, I came across eight 40% silver coins, one 1987 s cameo proof, and one mint error that had the edge clipped. I'd say that's not too bad for a day's hunt. The total cost of all this fun? Nothing! All of the coins I'm not keeping go to another bank to cash in. The keepers may go on Ebay for a small profit. Nice coins can be found in any denomination, so buy rolls of what you enjoy collecting, and go have yourself an enjoyable treasure hunt during those cold, wet days. Good luck! According to legend, Joe Hunter found the old bucket with the outlaw contract near Tarbone Mountain in the Wichita Mountain Range. He was one of the first treasure hunters to get legal permission to hunt on the Refuge. Today, though, treasure hunting on the Wichita Mountains National Wildlife Refuge is illegal. It has also been said that Hunter got the bucket from an old prospector who had found it years before. I have some proof that this may be the case, but that will be covered in the book I'm writing. What we do know is that this contract was actually a treasure map in itself. After organizing a bounty bank, the James gang went to the west side of the Keechi Hills. These hills run from the northeast of Cyril to the west of Cement, Oklahoma. To the west side of the Keechi's is a lone hill known locally as Buzzards' Roost. This is also the hill where Joe Hunter found the cast iron kettle with the copper map inside and the area where Frank James recovered at least $6000 he had hidden during his outlaw years. The contract says Jack was buried just east of the lone hill. Those who made it to my treasure hunter get-together saw the picture Joe Hunter had taken showing JACK as he was laid out. Sadly, oilfield construction has long since destroyed this site. Jack's grave was east of a rock. Joe found this rock with its carvings. My partner has the original picture Joe had taken of this rock, and, as far as I know, it has never been published. Maybe this will be something included in the book with his permission. Here comes the sad part, though. This bounty bank was uncovered many years ago by a work crew digging a pipeline. It was enough that they never came back to work digging ditches. As a side note Jack's grave was about 50 yards from a set of carved crossed rifles. These were on the north side of the roost. I still have plenty of copies left of Jesse James Rides Again. Written in 1948 this is the first indepth story of J Frank Dalton. He revealed to the world that he was really Jesse James. These booklets were written by the Lawton Constitution reporters who broke this fascinating story in Lawton Oklahoma on May 19 1948. These copies are like new. If you're interested in a copy they are $20 and that will include shipping. Just e-mail me at okietreasurehunter@msn.com for more details. J Frank Dobie told of the two million in his book " Coronado's Children". His source was a man named Pete Givers. This story is somewhat different than what Steve Wilson tells in "Oklahoma Treasures and Treasure tales". What they both have in common is Cache Creek. Dobie hints at it being hidden in the creek along the road from Ft. Sill to the Keechi Hills (located in Caddo County not Comanche county) and Wilson tells of crossing the creek during a blizzard and it being buried in a ravine some distance away. 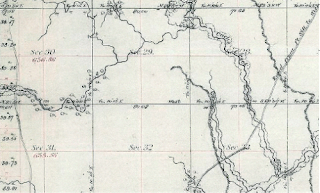 There was one crossing on Cache Creek during this time and it was located just south of present day Apache Oklahoma. Now the strange thing here is that Frank moved into the area to "farm" just a few miles east of this crossing. Wilson tells of a doctor meeting Frank on a hill and asking Frank why he just set there looking out into the vastness. There are some hills near this crossing by the way. What Frank told the doc isn't known, but it was enough for him to spend thousands in his search for the gold. The doctor did find what were assumed to be clues to the cache location. I have heard it said that this location was found near Ft. Sill, but I know that the slip used for digging out this spot was left at the location and removed a number of years ago. It would post date the time of the doctors dig. The correct location of the doctors dig is to the east of the old crossing. There are a number of deep ravines between there and the Keech Hills. I know of the correct site, but the gold was long removed. Jesse and his gang came back at a later date and removed the 18 burro loads and made a number of smaller caches. This explains why several maps have references to jack loads of gold. The Early Morning Star Map to Gold is one of them. It shows three jack loads. That leaves 15 more that are out there. Several of these were recovered. Just how many nobody knows for sure.